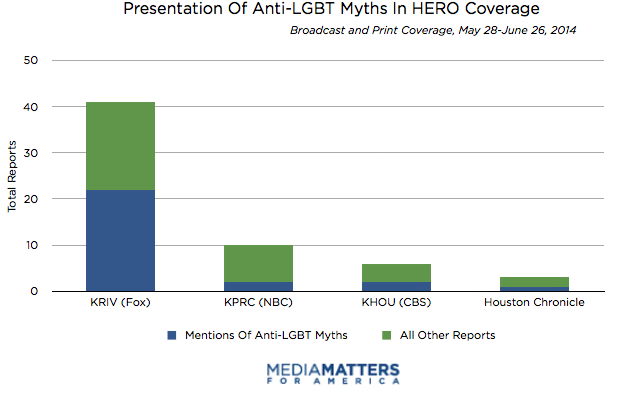 Houston media outlets helped spread misinformation about the city’s newly enacted non-discrimination ordinance, parroting the talking points of anti-LGBT groups working to repeal the measure. On May 28, the Houston City Council voted 11 to six to approve the Houston Equal Rights Ordinance (HERO), which prohibits discrimination based on categories including race, religion, disability, sexual orientation, and gender identity. Opponents of the ordinance, led by the Houston Area Pastors Council, immediately announced a repeal drive and have spent the month of June attempting to collect the 17,000 valid signatures needed to put the measure up for a vote in November. Anti-LGBT activists, like Texas Values’ Jonathan Saenz and Fox News’ Mike Huckabee, focused particularly on the measure’s protections for transgender people, asserting that the protections will make it easier for sexual predators to sneak into women’s restrooms. That myth has been extensively debunked by independent experts in states and cities that have already adopted similar protections. 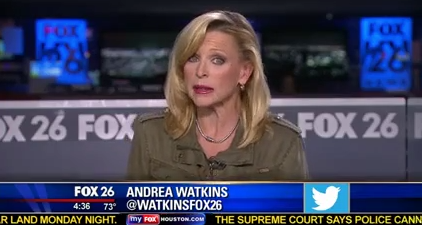 WATKINS: The element that has the ordinance in trouble is the bathroom clause, allowing anyone to use any bathroom. Many feel discriminating against the GLBT community is wrong. They don’t feel that should translate into open bathrooms. Contrary to Watkins’ assertion, there is no “bathroom clause” in the measure, let alone language “allowing anyone to use any bathroom.” The measure does allow transgender people to file a complaint if they’re denied access to facilities that correspond to their gender identity. As experts note, access to appropriate facilities is essential to the health and well-being of the transgender community. “Bathroom panic” has long been central to anti-LGBT activists’ efforts to undermine basic non-discrimination protections. It stokes baseless fears, marginalizes a vulnerable group of people, and disingenuously tries to shift the terms of the debate from non-discrimination to the threat of criminal misconduct. It’s the responsibility of media outlets to identify and discredit such cynical ploys, not perpetuate them.